I did another trail race today. The Festa Trail starts and finishes in Saint-Matthieu-de-Tréviers, a town in the Pic-Saint-Loup vineyard region north of Montpellier. It's a 3-day multi-race event. 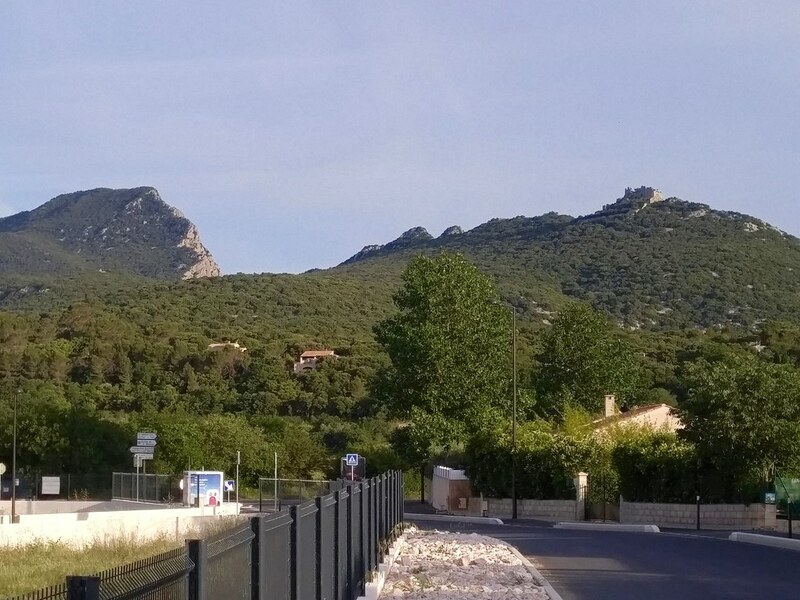 I ran the 18 km Tour de Pic Saint-Loup with 875 meters of elevation gain in 2:36:10 (unofficially). The French word pic is related to the English peak. According to Roger Brunet in Trésor du terroir: les noms de lieux de la France, pic does not, despite common characters, have the same origin as the French puy, Catalan puig, or Occitan puech, all of which derive from the Latin podium. The Château de Montferrand seems to have its origins as a Roman fort and was mentioned for the first time in 1132 as a property of the Count of Toulouse (who I've mentioned before). It passed into the hands of the French crown and remainded a royal fort until Louis XIV authorised its demolition in the 17th century. We stormed the castle during km 4 of the run. I felt good most of the way, made it through some mild calf cramps around km 15, and managed a bit of a kick at the end. There was one steep kilometer of going up (200 meters) to the ruined castle on the way out and one steep kilometer coming down from the peak on the way back (190 meters), but nothing so sustained as at the Trail Quillan. The trail was completely dry and very rocky (caillouteux, we say here), treacherously so in several spots. There's a layer of limestone that has splintered crazily and traversing it was like running on the threads of a giant screw. Festa Trail is a fun race and I highly recommend it. With time running out on our séjour, it might have been my last trail run in France this year.